When your child becomes an ex-pat in another country, f you're very lucky, your child will take you on adventures that you might have missed along the way. The fairy-tale lover in me has always wanted to experience the Christmas markets in Germany. The nooks and crannies, the nearby gnarled woods, the light in the dark and the magical occurrences that all seem possible this time of year. Chandeliers in Baccarat crystal guide you to the Place de la Cathedrale, where the main market is. It's all flight and fancy. It's hard to make it to the main market, because you have to stop at every window. Every. Single One. The Charcuterie knows what they are about. Outside the Cathedral, there is the usual array of ornaments (yes, I bought some), cookies (yes, we ate some), nuts, Gluhwein (yes, we drank some) and artisan gifts crafted from wood and stone. And then there is this tree. The story behind the magic is here. After Strasbourg, we went to Matthew's "home" town of Quedlinburg. It's where I first fell in love with the Moravian star also knows as the "Herrnhuter." It's origins come from Saxony (where Quedlinburg is located). Of course, it also has a story. Find it here. I love the smaller towns and their personalities. While Strasbourg is adorned with crystal, Quedlinburg is all about the nearby forests and Harz mountains. Timber and greens are everywhere. You will be filled with music. The market was just getting going. And there was Gluhwein to keep you warm. We went to the Advent Fair in Quedlinburg. Every alley, every small park, every groove called to you with warm lights, hearty meats, wine, beer, and hand-crafted items. As is my way, I relive this memories with food because as much as I love the travel, I am also more than 50% "There's No Place Like Home." Home incorporates where you've been and who you are now. German food has a lot in common with Minnesota. It's hearty for the winter. It's yeasty and earthy and is fond of calories. 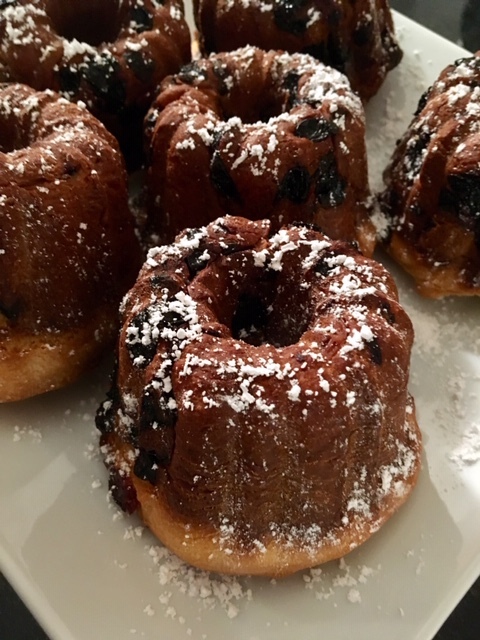 The Kugelhopf many have originated in Vienna, but Alsace upped their game and it is one of the most traditional Christmas foods in the region. 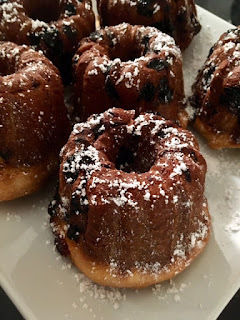 They use a Kugelhopf pan (I used a Bundt). It's easy to make even if you're afraid of yeast (I murder yeast). I did the minimum cooking time and they were darker than I wanted. But live and learn and live to bake again. 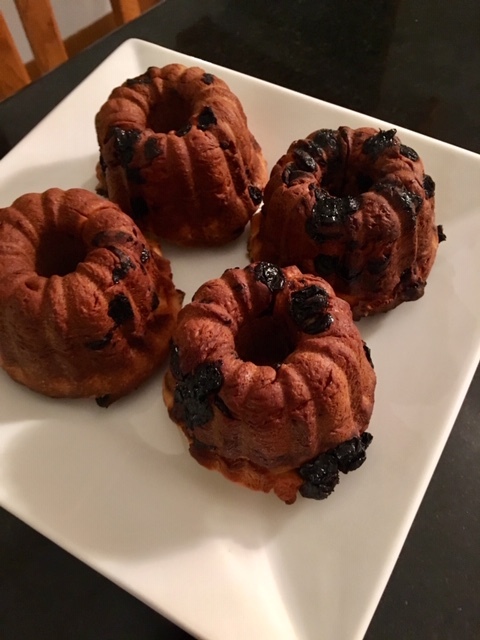 Butter kugelhopf mold with remaining tablespoon butter. (I use Pam) Put 1 almond in each depression in bottom of mold (the almonds are only decorative; you can skip them altogether if your mold has no depressions), then scrape spoonfuls of dough evenly into mold (dough will be very elastic). Cover top of mold with oiled plastic wrap and a kitchen towel and let dough rise in a warm place until it fills pan, about 2 hours. Remove towel from kugelhopf and gently peel off plastic wrap. Bake kugelhopf in middle of oven 15 minutes, then loosely cover mold with foil and continue to bake until golden and a tester inserted in center comes out clean, 20 to 25 minutes more. (20 minutes was too long for my oven. I would check at fifteen minutes even if you use a light-colored pan). Cool in pan 2 minutes, then invert cake onto a rack to cool completely, about 1 hour. Dust with confectioners sugar. · Kugelhopf is best eaten the same day it's made; however, leftovers are delicious toasted. · Use a light-colored metal pan. Because they retain more heat, dark metal pans, including nonstick, will likely make your baked goods darker and decrease the cooking times. Wishing you holiday enchantment and wonders and goodness in 2019. I've been in Minnesota for a long time now. Longer than my many years in New York City. And something has happened - I look forward to January. You may wonder - do I really look forward to temps colder than the arctic? And snow that stays from December through April? Have I lost my mind? Maybe. I like the slow pace. Darkness comes and I am inside with my writing pencil and my books. 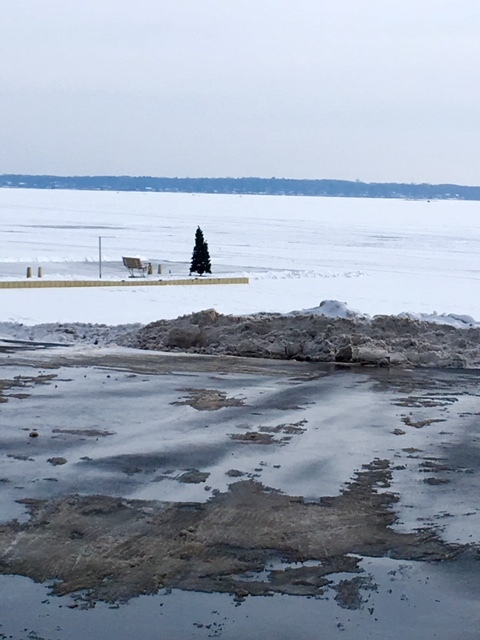 I am not conflicted - wondering if I should be outside weeding, flicking Japanese beetles off my plants, exercising outside or replanting when the warmth comes. I have two boards on Pinterest that are seemingly the same: "Gezellig" (Dutch for that warm cozy feeling that candles and fireplaces and purring cats give you) and "Slow Living" - for those moments that beg you to slow down. I have a list of 12 "slows" that I read every morning - slow-money, slow-exercise, there's even a "slow journalism" - where you read the effects of a newsworthy article weeks even months later - after the dust settles. There's an English periodical devoted to that. The anti-twitter. I am liking that idea a lot. And then there's the food. Bye-bye lean meats and 1,000 variations on a wedge salad. Hello pasta and melted cheese. Hello spaghetti pie - Cacio e Pepe Pasta Pie to be exact. I made this Christmas Eve. There were 35 people in my home so I took a slice and hid it for when I would have time to savor it. I'm glad I did. The pie was gone in an instant. In a bowl, mix pasta, milk, Parmigiano, eggs, pepper, salt and 1-1/2 cups of the Fontina and cheddar. * Scrape into a buttered 9-inch springform pan. Then sprinkle the remaining 1/2 cup of Fontina and cheddar on top. *even though I wrapped aluminum foil around the springform pan and put it on a pan to collect excess milk, the milk came pouring out. I would either use less milk or drain most of the milk that the pasta did not absorb before scraping all into the springform pan. Bake the pie for 35-40 minutes until the cheese is melted and bubbling. *I did not broil the pie. I baked it for 40 minutes and had enough browned, crunchy cheese on top! Transfer to a rack and let it cool for fifteen minutes. Remove the ring, cut the pie into wedges and serve. It works as a side but now that it is indeed January - this works for me as a main dish. You can lie to yourself and balance it with a salad and say "See, healthy eating." I don't make crazy resolutions. I do make "think, Claudia, think" notes. Remember all those years of fearlessly declaring how multi-tasking was the future? I am now thinking, one-thing-at-a-time. There's something to be said for being the tortoise and not the hare. Pino has the right idea. A box and a little sun. Sometimes that's all you need. And a little spaghetti pie. "Always on Christmas night there was music. An uncle played the fiddle, a cousin sang "Cherry Ripe," and another uncle sang "Drake's Drum." It was very warm in the little house. Auntie Hannah, who had got on to the parsnip wine, sang a song about Bleeding Hearts and Death, and then another in which she said her heart was like a Bird's Nest; and then everybody laughed again; and then I went to bed. There's comfort for me in the phrase "Always on Christmas night..." After a ridiculous number of courses (plus some scotch or whiskey, wine and cognac), my Italian and Uncles would indeed start singing around the "adult" table while my cousins and I (at the cousins table) watched in horror. I am so glad for those days. My husband had oyster stew ever Christmas Eve in honor of his father who was born on Christmas Eve. 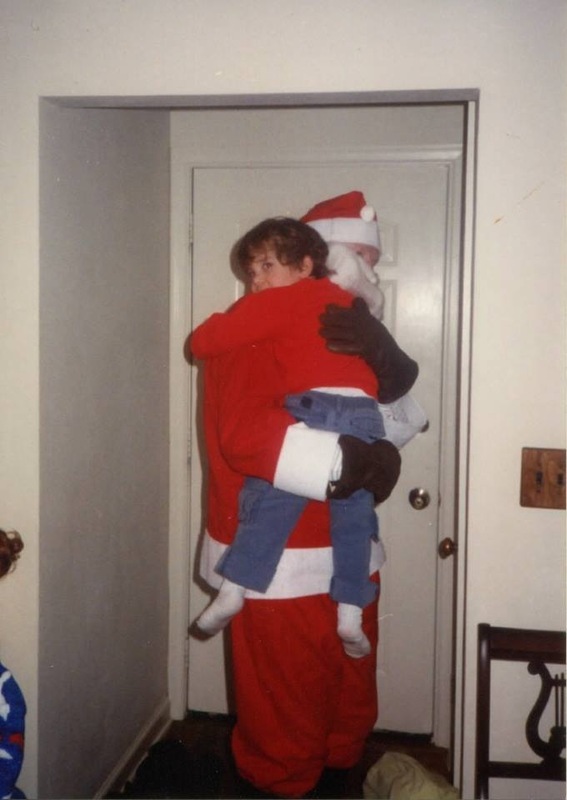 When my father-in-law's first grandchildren appeared, he was Santa for over a quarter of the century every Christmas Eve. Every grandchild sat on his knee. Even when the knee was giving way. I'm grateful for those days, also. My son waited for Santa by the door and would fly into his arms. I'm very grateful for those days. And grateful that the uncles have kept the tradition for my grand-nieces and nephews (two new grand-nieces arrived this year). Grateful. This year, I have found comfort and strength in looking back to go forward. My baking is a combination of traditional American cookies and the old Italian ones. I have shared the Italian ones before but I am revisiting them for memory brings comfort. Christmas Past, Present and Future coexist is my kitchen. Funny what a cookie can do. And ricotta cookies (my favorite and judging by the fact I need to make them a few times during the holiday season - it's a favorite of others). Preheat oven to 350 degrees F. Grease 2 baking pans. Combine flour, baking powder, baking soda and salt in a medium bowl. In a large bowl, cream butter and sugar and mix well. Add eggs, one at a time, mixing well after each addition. Add the zest and juice and briefly mix. Add the flour in 3 additions and mix well. If dough is too sticky, refrigerate for an hour. Preheat oven to 350 degrees F. Set aside baking sheets. No greasing required. In a large bowl or stand mixer, combine the zest and sugar. I add the zest for a brighter flavor - the cookies will not be lemony. Add the butter in chunks and the ricotta cheese and beat till smooth. Add the egg and vanilla extract and beat till combined. Slowly add the flour mixture. Beat until all is combined. Dough will be soft and a bit sticky. Bake for fifteen minutes - until bottoms are browned but cookies are not. If desired, glaze immediately while warm and cover with sprinkles (immediately - the glaze dries quickly) or just use the glaze. Cool and serve. Combine powdered sugar, vanilla and milk in saucepan. Stir over medium heat till the mixtures turns liquidy and into a glaze. Brush tops of ricotta cookies as soon as they come out of the oven and cover with sprinkles. These are not an overly sweet cookies, so if you like your cookies sweet, the glaze is a good idea. If you like a not-so-sugary cookie, simply cool. Quedlinburg: Where we visited Matthew in September and this week - Matthew comes home for Christmas. Grateful. We visited the castle and he visited the Christmas Markets. There's at least one more trip to that medieval city in my future. Grateful. Pino (mostly) stays under the tree these days. The bottom third of the tree remains undecorated. And he still rings the bell every day. Many angels have gotten their wings. Wishing you bell ringers and cookies in 2017. Say some words to the close and holy darkness before the New Year. Wish the world well.